Howard Wiest’s life began and ended in very turbulent times of U.S.history. He was born at the height of the Civil War and died shortly after World War II ended. Wiest was born in Macomb County, on February 24, 1864.Wiest’s education was varied. He left school before completing high school to become an apprentice in the machinist trade. But Wiest made a change of direction and ventured to the city of Detroit to enter the law offices of Atkinson and Atkinson as an office boy and student. Upon admission to the Bar, he began his professional career with an appointment from Governor Cyrus Luce as Circuit Court Commissioner in 1887, serving through 1888. In April of 1899, he was elected Judge of the Thirtieth Judicial Circuit, and was re-elected in 1905, 1911, and 1917. 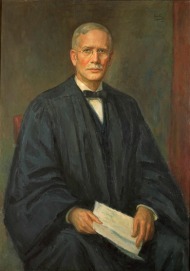 His term as Circuit Judge began on January 1, 1900, and he served continuously for twenty-one years. Another matter of sincere personal satisfaction and pleasure to Wiest was the enjoyment of his simple country estate near Williamston. He would wander around his estate in a battered straw hat set firmly on his head, collarless, corn-cob pipe in hand, greeting all while maintaining the dignity which never deserted him. Howard Wiest died on September 16, 1945.